Tamil Nadu is one of those places, which saw the appearance of Christian religion in India. It is whispered that St Thomas, the apostle of Jesus Christ came to Madras (now Chennai) around 52 AD. He was killed in the year 78 AD and a church was later built on the San Thome beach. Later on, with the coming of the Europeans in India, Christianity extend not only to Tamil Nadu but also to other parts. As the Christians developed in Tamil Nadu their place of adoration (Churches) also started dotting the religious landscape of the state. 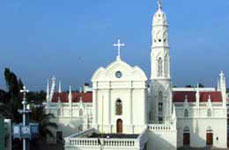 Have a look at some important Churches of Tamilnadu.